We are well and truly into the hot season now. The week has been hot, real hot. You want me to tell you how it feels? Fool, it's hot! I tell you again! Were you born on the sun? Gooooooooooood morning Phuket! It's hot and humid, which means the perfect clear skied mornings of a month ago are gone. Hazy is the word. Hot and a bit hazy. Winds are light, and the whole week up to Thursday could be summed up with one word : HOT. Do I have to say HOT again? And I doth verily thank the Lord for aircon. Anyone who says they don't need it, don't like it, oh yeh? It's HOT now, and aircon is KING. The heat and humidity can be quite tiring. I have felt rather dozy in the afternoons this week. Thailand - Mr Abhisit - can we maybe vote on allowing siestas in Thailand during the Hot (I said it again) season? The continual humidity and heat also means there has to be some rain sometime. I predicted it would come this week. Have not seen rain for a few weeks. Friday morning was wet, a good old fashioned yee-haw tropical downpour for a couple of hours, just to freshen the air and I swear the trees looked happy. Water! Saturday! A day off for me, Valentines day, 14th February. My family is my life. I love them. A day with my family is worth a thousand days. Today we have been off Phuket, exploring in Phang Nga. Yes, the day was (dare I say it?) HOT, but we felt like a proper day out. The day will be blogged soon enough on my Phuket blog, and included a visit to Wat Suwan Kuha, where you find a large reclining Buddha and other Buddha images in a cave along with bats and monkeys. We also tried a very nice floating restaurant called Samchong Seafood, between Phang Nga town and Sarasin (the bridge into Phuket). We will go back to this one. Back in Phuket we took the kids to ride bikes at Bang Wad Reservoir. Followed by (kids choice) dinner at Dairy Hut restaurant in Phuket Town. Forecast: More of the same hot and hazy weather in Phuket. See you soon! 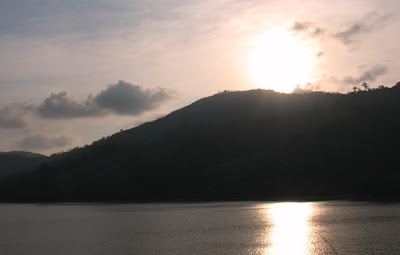 Photo below: Bang Wad reservoir in Phuket, 14th February.